The T-Mobile MyTouch 4G is a mid-price Android phone released in November 2010. It features Wi-Fi calling and mobile hot spot capabilities, along with a handful of other useful features that set it apart from the competition. If you own this phone and have begun to notice a steady increase in the number of hang-ups, freezes, and down-time during normal usage, it could be time to perform a factory reset. It’s not difficult to hard reset the T-Mobile MyTouch 4G, but there are some things to consider before attempting any of the two methods described below. 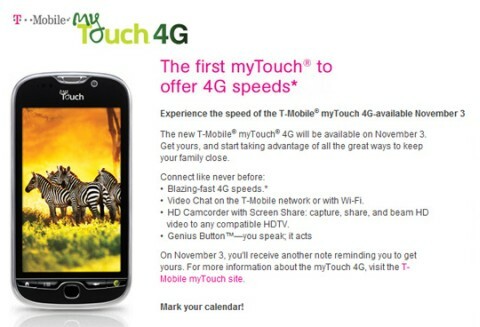 The T-Mobile MyTouch 4G was well-received at its launch, with many reviews praising its ease of use and modern capabilities. The one major pitfall that it stumbled into was the video chat feature, which didn’t seem to work for anybody involved. Despite this, the phone’s other features were largely praised and it went on to become a moderately successful sale for T-Mobile. The phone includes a MicroSD card which can offer up to 32GB of extra storage. This MicroSD card is unaffected by the reset process, so you can safely keep your data backup on it if you like. Speaking of data backups, you will need to make a complete backup of your personal data and user info before resetting your T-Mobile Mytouch 4G to factory settings. Data on the MicroSD and SIM cards is safe, but your applications, photos, documents and other files will be erased, so you must be able to restore them from another location. Enter the Menu, then Settings. Enter Privacy and make sure that both Backup My Settings and Automatically Restore are left unchecked. Go back to Settings and enter SD & Phone Storage. Choose Factory Data Reset, then Reset Phone. Tap on Erase Everything, let the phone turn itself off and back on and you’re done. Forcibly turn off the phone by removing the battery, then re-insert the battery. Hold both the Volume Down and Power key. After a few seconds, release the Power key but not the Volume Down key. Release the Volume Down key when the Android logo appears. Of the options that appear, choose Factory Reset using the Volume keys and Power button to enter. The phone will reset itself, turning back on with a freshly installed operating system. The first step of this process may seem unnecessary, but T-Mobile added a Fast Boot feature in this phone which will prevent it from booting into Recovery Mode if the phone has been turned off normally. You must remove the battery while the phone is on in order to enter this user mode afterwards.